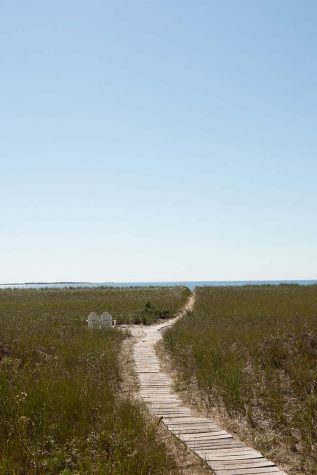 On the "ocean side", a path through the dune grass leads to Grand Beach, a sandy stretch that runs into Old Orchard Beach to the south. 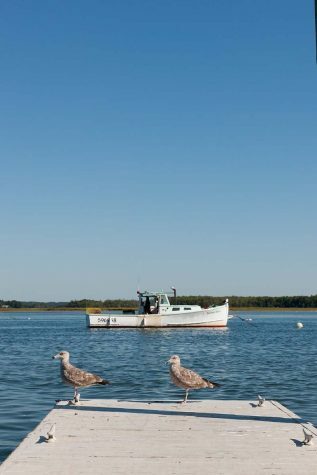 On the "marsh side" of Pine Point, residents enjoy views of the town dock, where 20 or so lobster fishermen take off for Saco Bay at sunrise every morning. 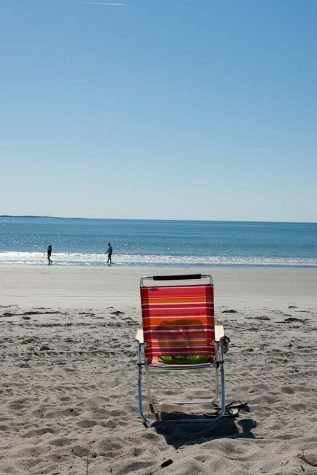 Sunbathers unite on Grand Beach. 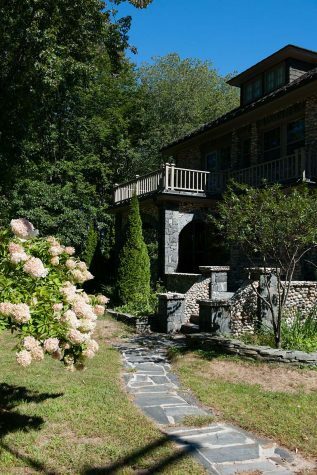 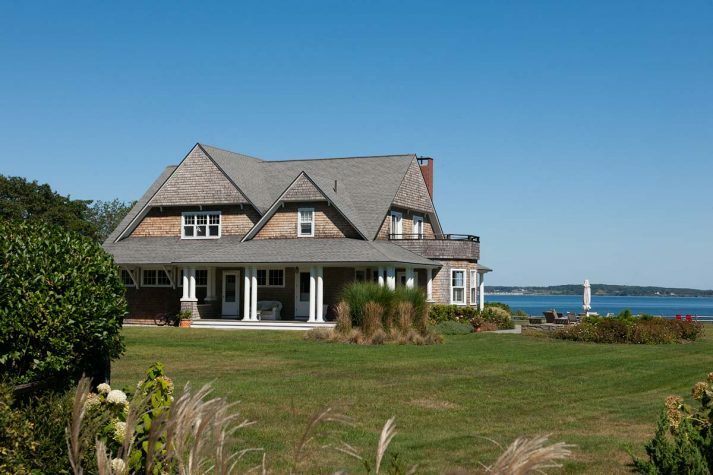 A widow's walk crowns a stately waterfront home. 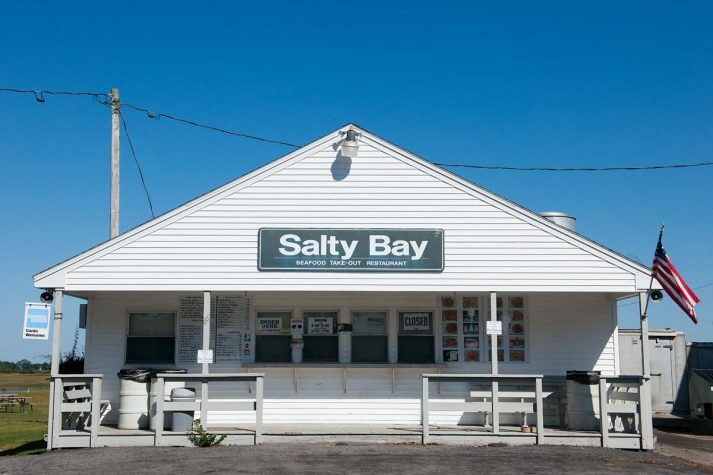 Salty Bay Seafood Take-out Restaurant is a popular spot on Jones Creek Drive. 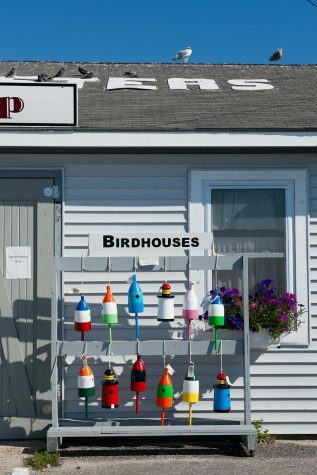 Colorful wares for sale at the Pine Point Fisherman's Co-op. 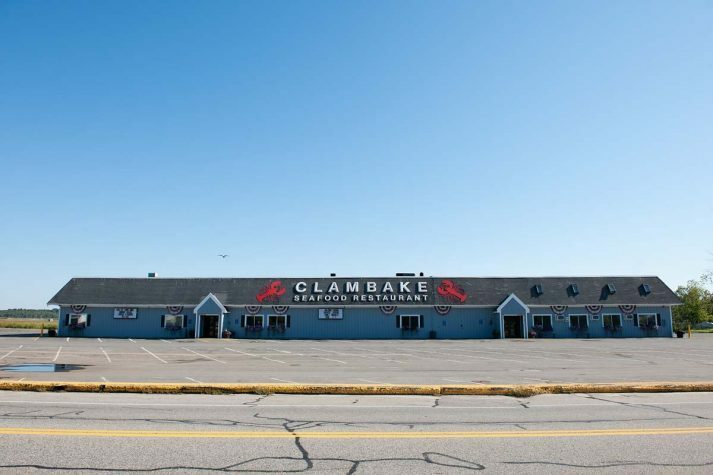 The Clambake Seafood Restaurant on Pine Point Road. 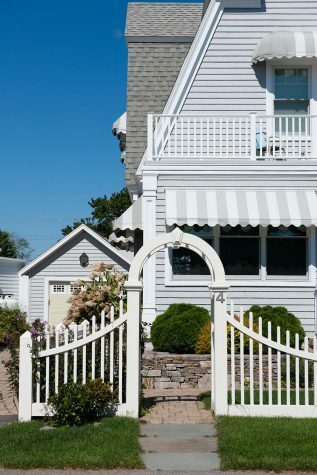 Al fresco dining at Bayley's Lobster Pound on Avenue 6. 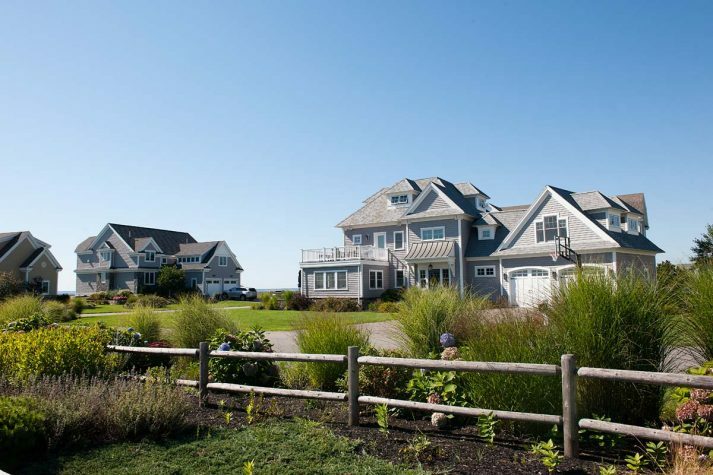 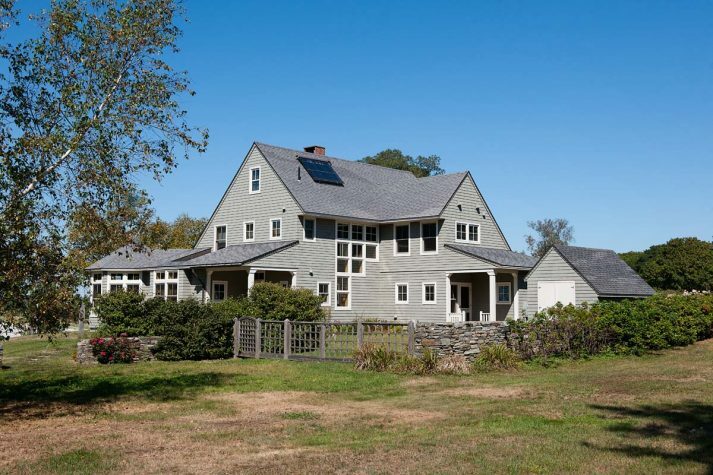 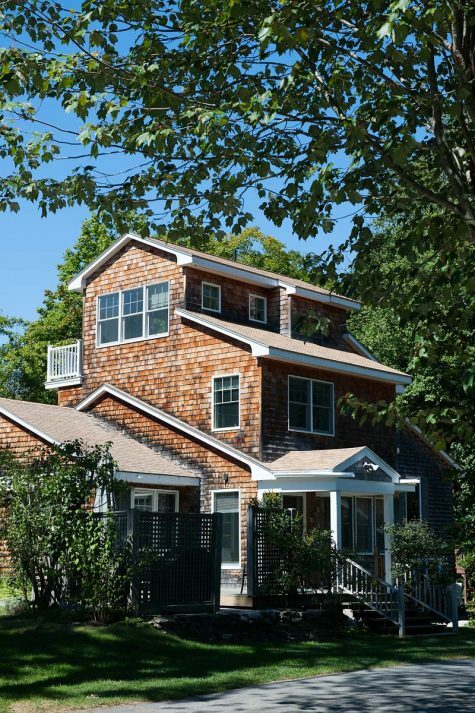 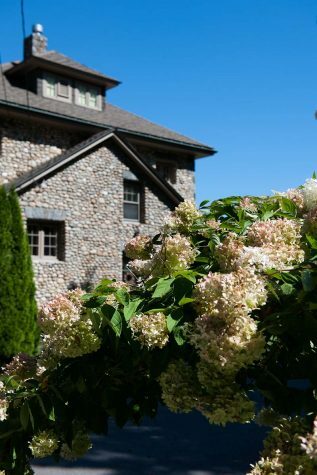 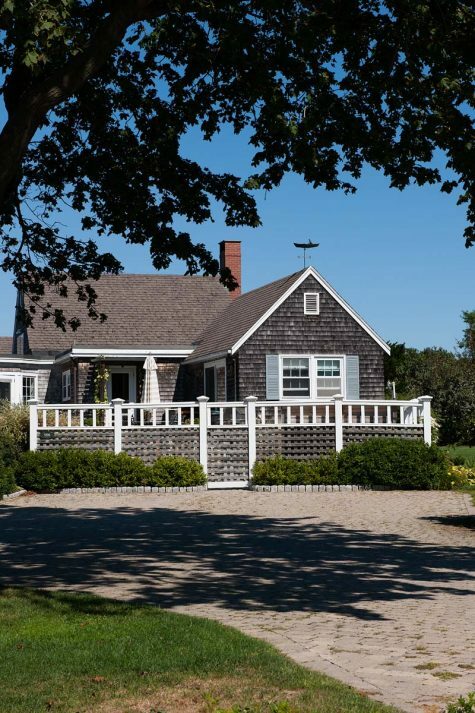 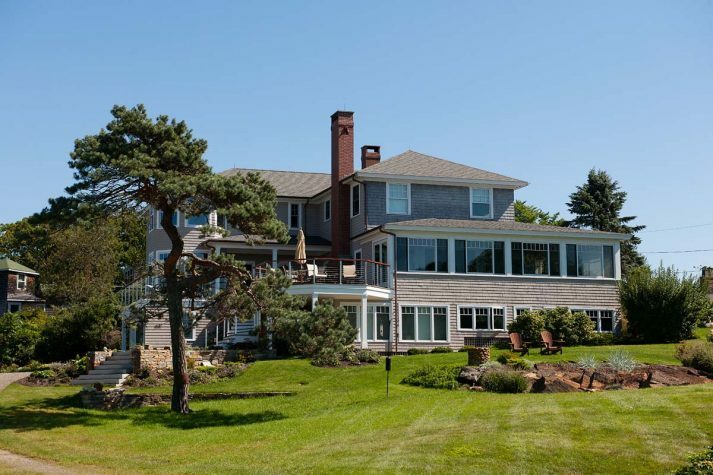 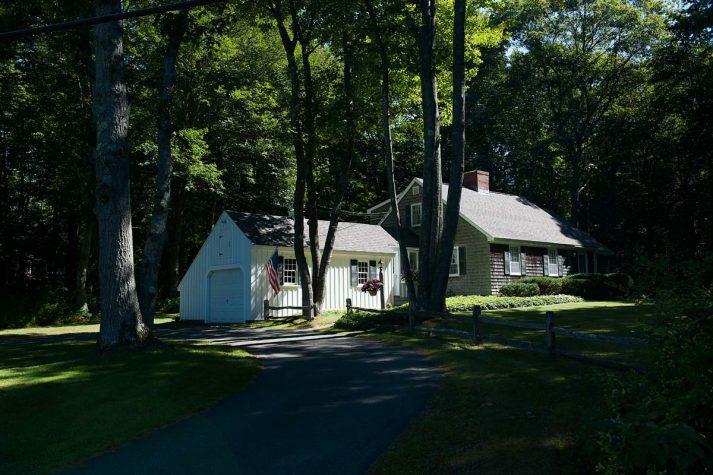 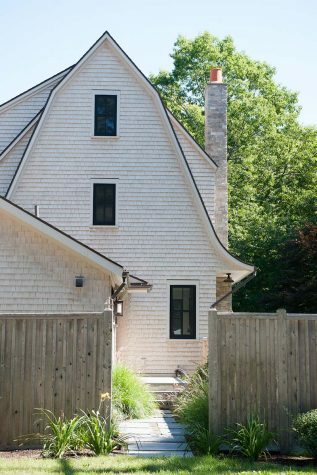 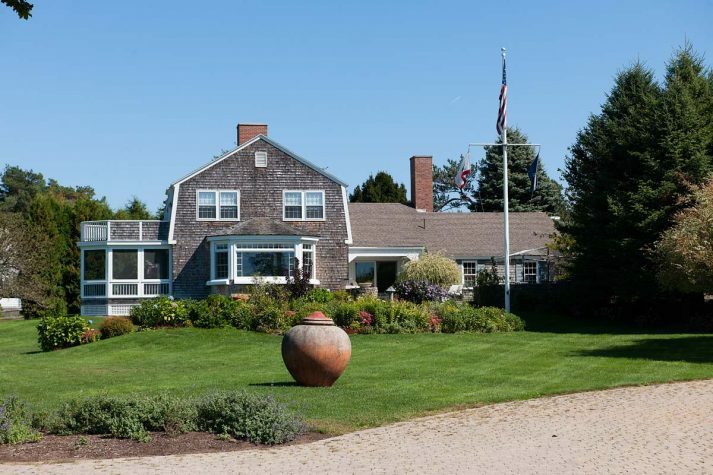 Grand homes and quaint cottages dot Pine Point's grassy lots. 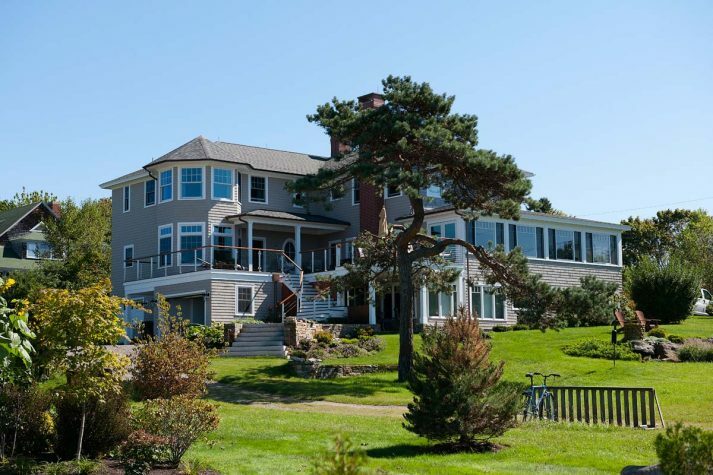 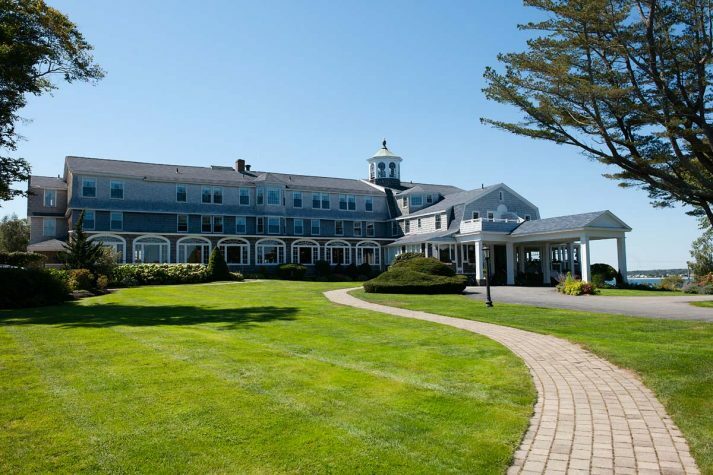 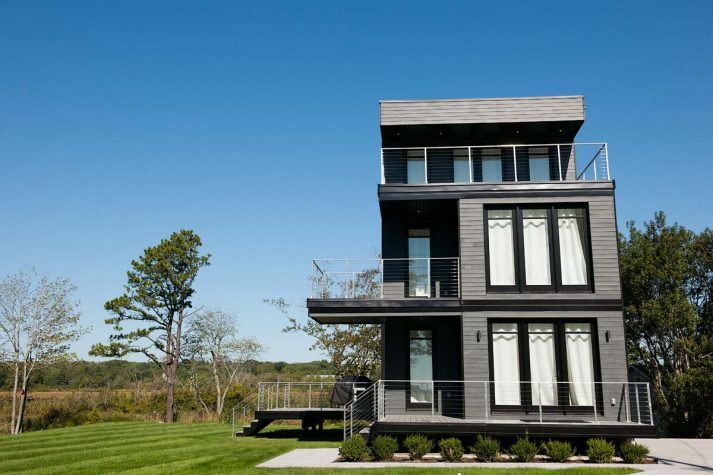 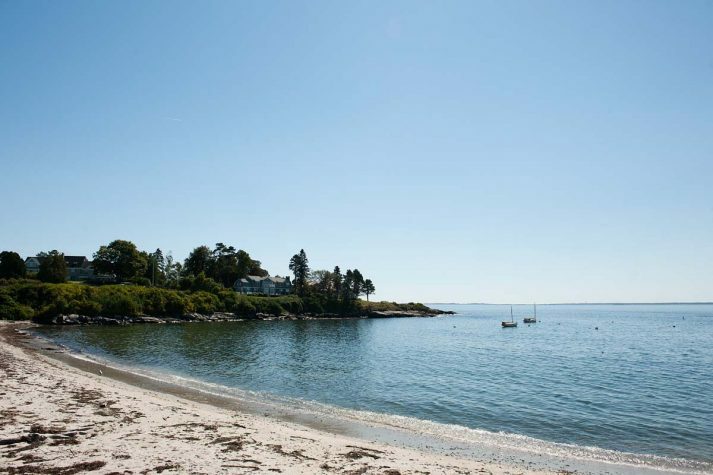 Scarborough is one of the fastest growing towns in Maine, and it’s not hard to see why. 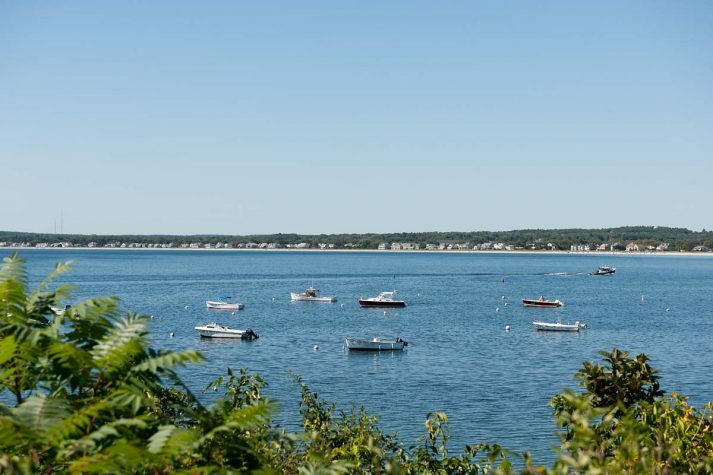 Im the southern corner of Cumberland County, the town is only a few miles from Portland and less than two hours from Boston. 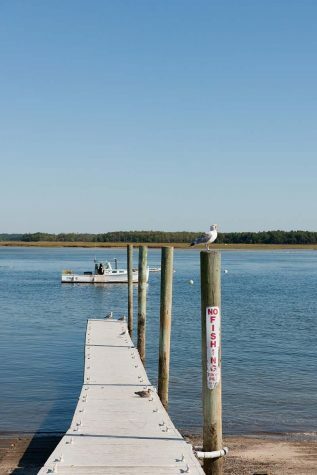 It’s home to sandy beaches, rocky cliffs, bucolic countryside, and the largest salt marsh in the state. 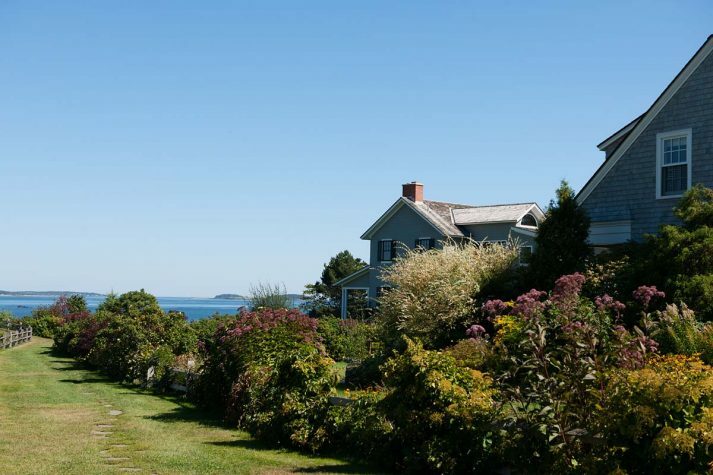 The latter if the defining feature of this coastal landscape. 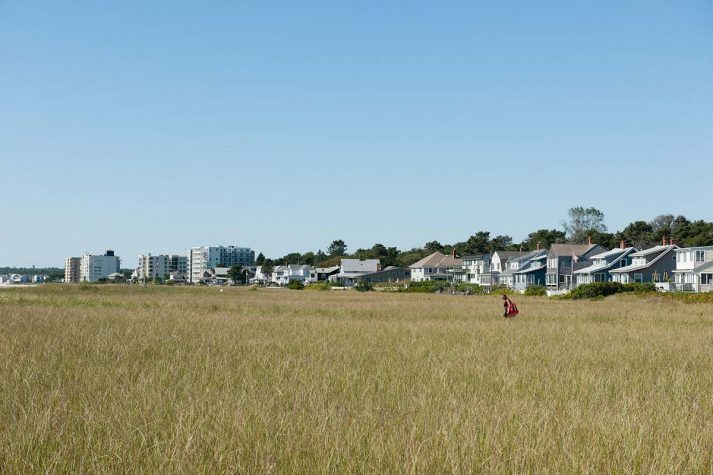 Expansive views of windswept grass and snaking tidal rivers are ubiquitous here and-especially at dawn or dusk -breathtakingly beautiful. 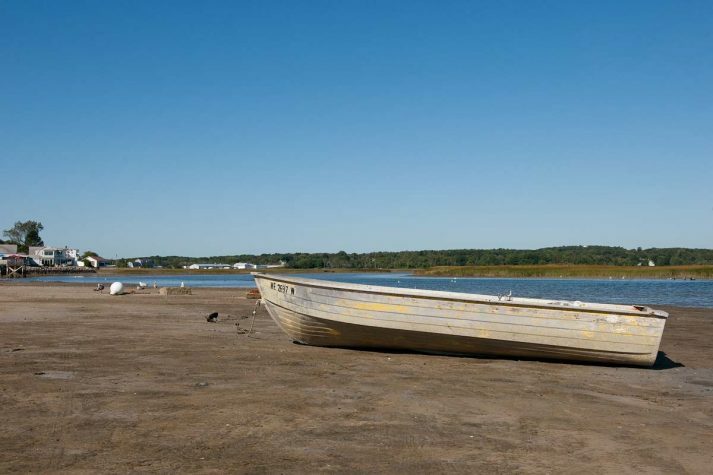 In addition to providing aesthetic value, the Scarborough Marsh filters pollution from the water and supplies food and shelter to a wide variety of fish, shellfish, mammals, and migrating seabirds. 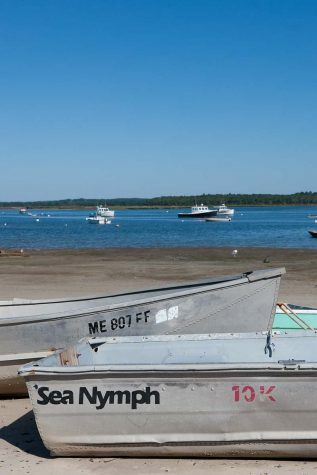 The town’s various neighborhoods have formed on spits of land within the marsh’s elaborate web of freshwater streams and saltwater rivers and at the mouth of Saco Bay, where the waterways converge. 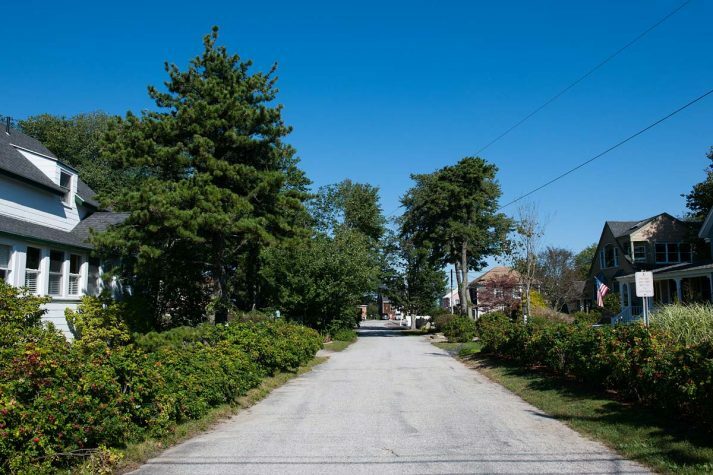 The neighborhood of Pine Point, set upon a narrow peninsula in the southeastern corner of Scarborough, has been shaped, both physically and culturally, by this dynamic landscape. 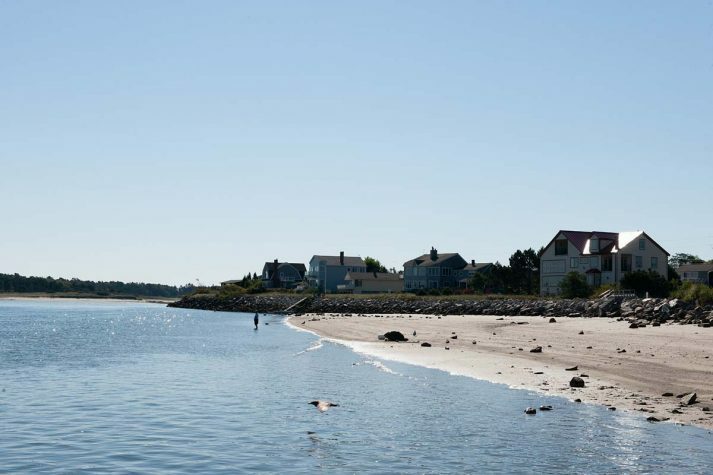 Within Pine Point there’s the “marsh side” and the “ocean side.” At low tide on the marsh, commercial and recreational clammers can be seen with their backs bent, rooting in the nutrient-rich flats for the mollusks that have helped make Pine Point’s seafood famous. 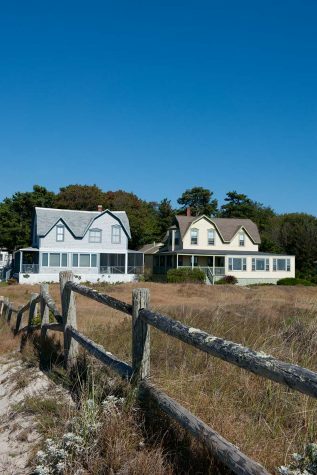 Early in the twentieth century, many local clamdiggers and fishermen built their homes along Jones Creek Drive, King Street, and the narrow avenues that stitch them together. 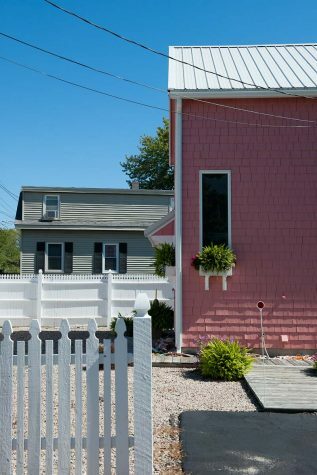 Today this old fishing village is filled with a combination of small, weatherbeaten homes and newer cottages packed together on narrow lots that engender a casual, beach vibe. 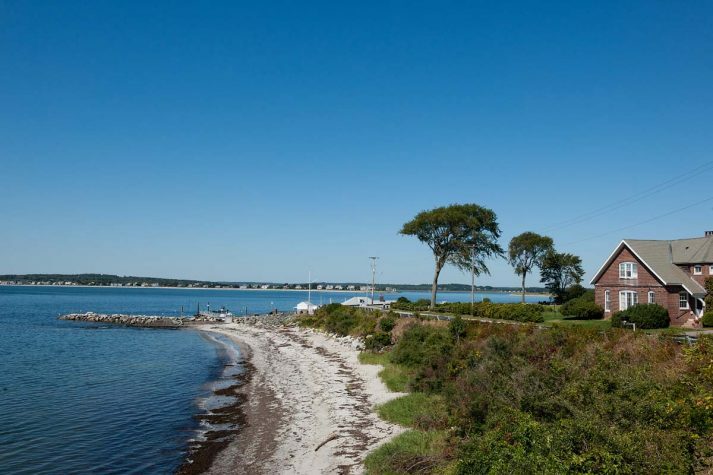 Partway down the peninsula, Jones Creek connects with King, which dead-ends at the Pine Point Fisherman’s Co-op and the town dock. 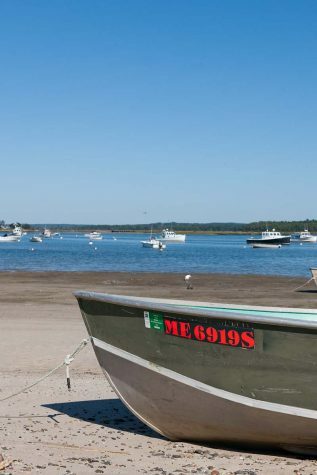 From there, 20 or so lobster fishermen take off every morning at sunrise for Saco Bay. 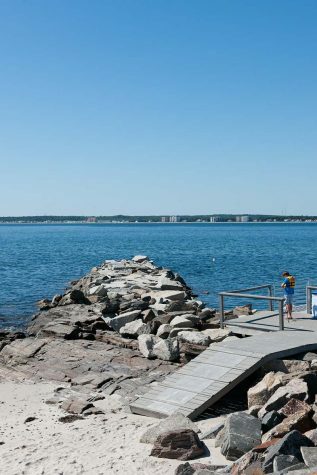 Pine Point’s ocean side more or less begins at this jetty, extends around the head of the peninsula, and continues along Grand Beach -a seven-mile stretch of sand that links Pine Point to Old Orchard Beach and Ocean Park and to the Saco neighborhoods of Kinney Shores and Camp Ellis. 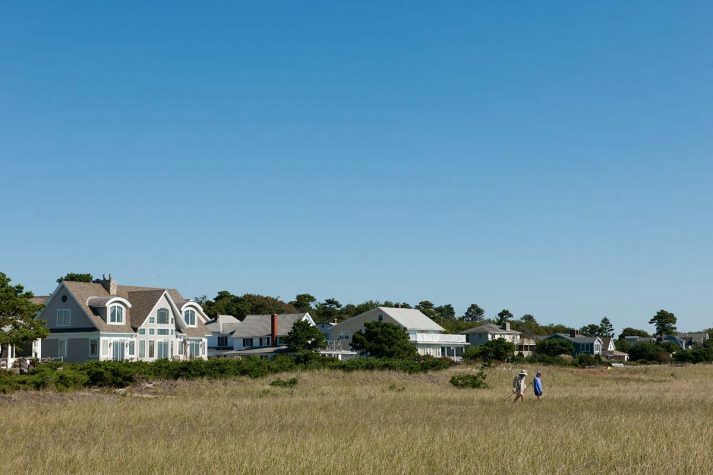 Grand Beach is the longest beach in Maine, and Peggi Howell, a longtime Pine Point resident and real estate agent, says that it attracts year-round residents, second-home buyers, and returning renters who appreciate the proximity to Portland and how family friendly the neighborhood is. 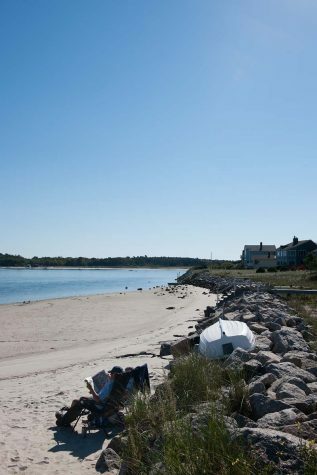 “Most people choose Pine Point for our peaceful beaches. 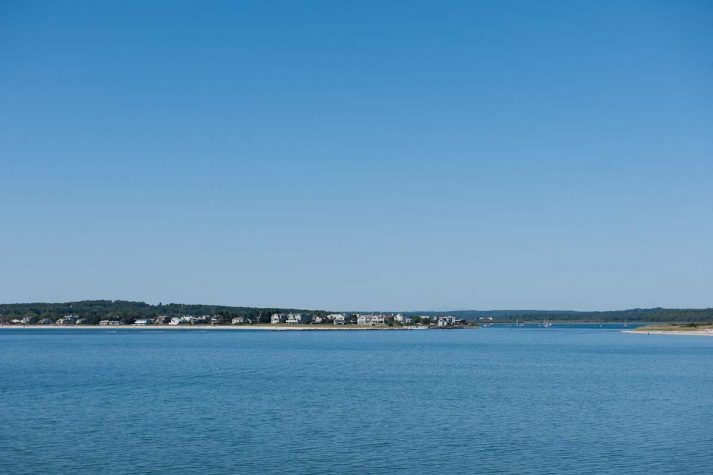 There are no tourist shops along the beach to entice you to spend. 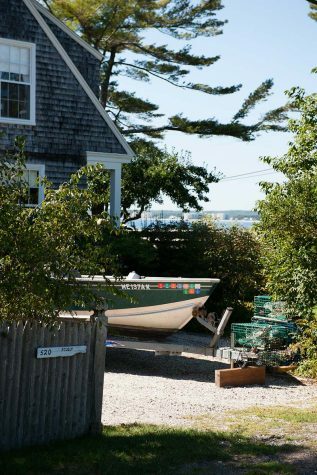 The big excitement might be watching the lobsters coming off the boat from the daily catch.” At certain times of year, dogs are allowed off-leash on the beach, an important perk for many who live in the area. 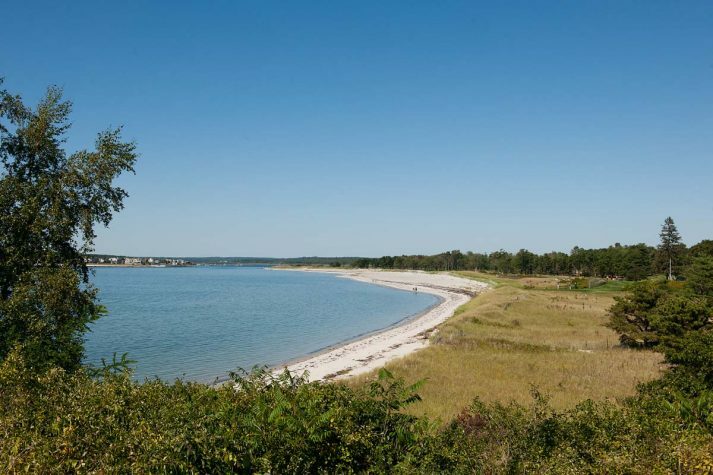 “It just brings a smile to your face to see dogs playing catch, swimming in the water, or running aimlessly in the sand,” says Howell. 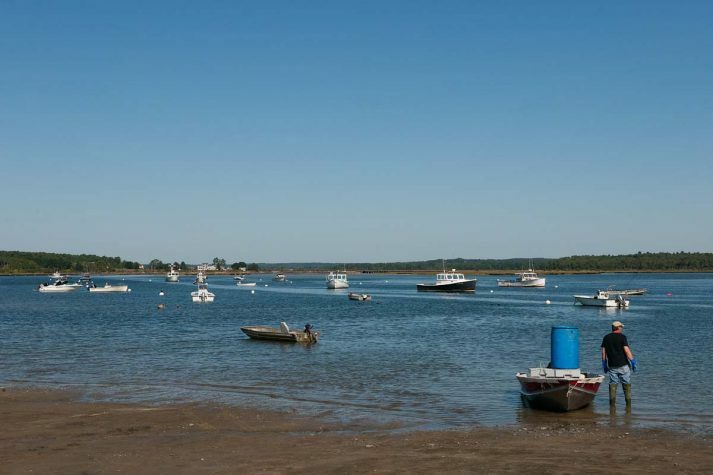 Still, Susan Bayley Clough, a fourth-generation Pine Pointer and the owner of Bayley’s Lobster Pound on Avenue 6, prefers the marsh side for its variability. 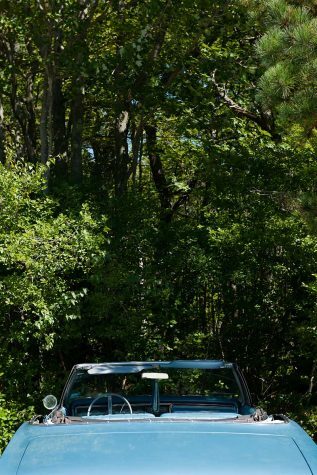 “It has so much character. 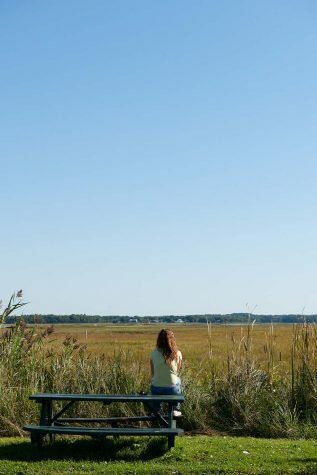 I can look out on the marsh and know immediately if it’s November or May based on the color of the grass. 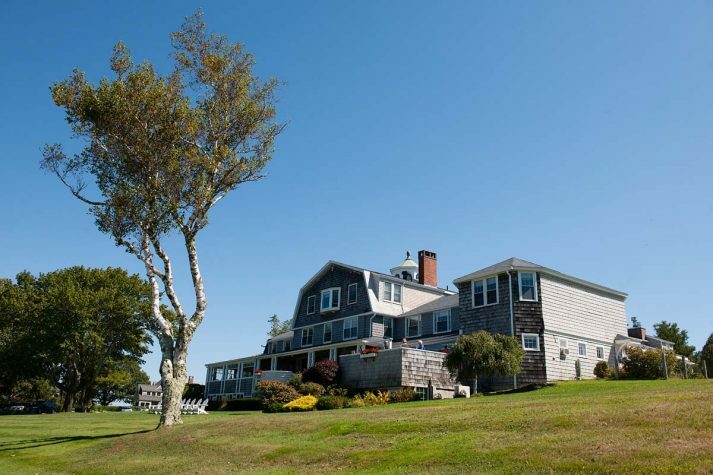 In 1915 Clough’s great-grandparents Stephen and Ella Bayley settled in Pine Point, where he clammed and fished while she cooked and sold lobster to tourists and summer residents through a window in their house. 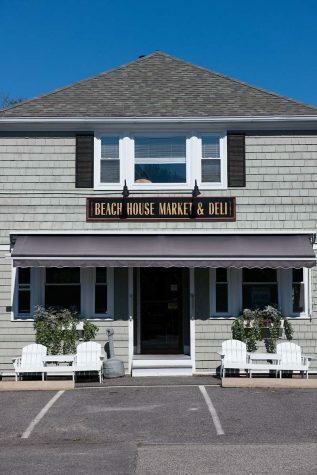 (Locals credit her with selling the first commercial lobster roll.) 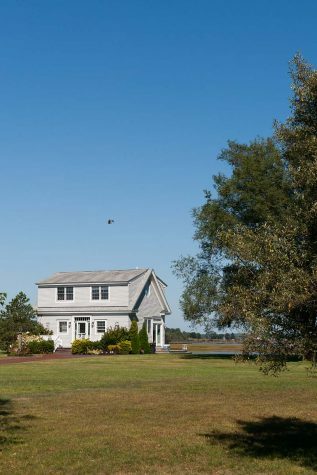 Bayley is one of a few prominent surnames associated with the fishing industry here and the popular seafood restaurants lining Pine Point Road. 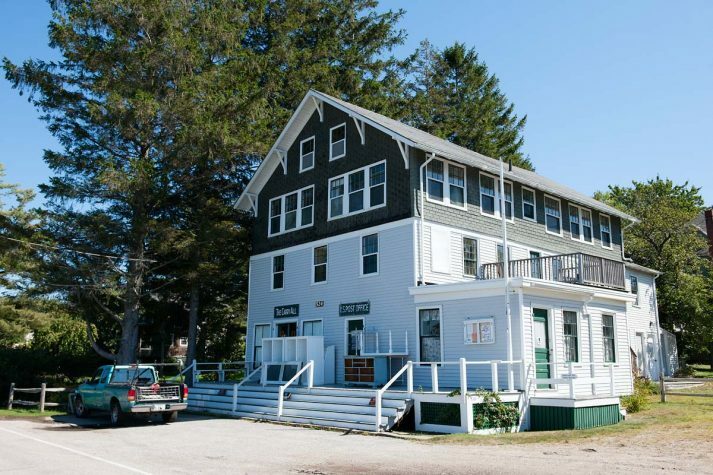 In July and August, it’s not uncommon to see dozens waiting outside places like Bayley’s Seafood Restaurant, owned by Clough’s cousin Stanley Bayley, Ken’s Place Seafood Restaurant, and the Clambake Seafood Restaurant. 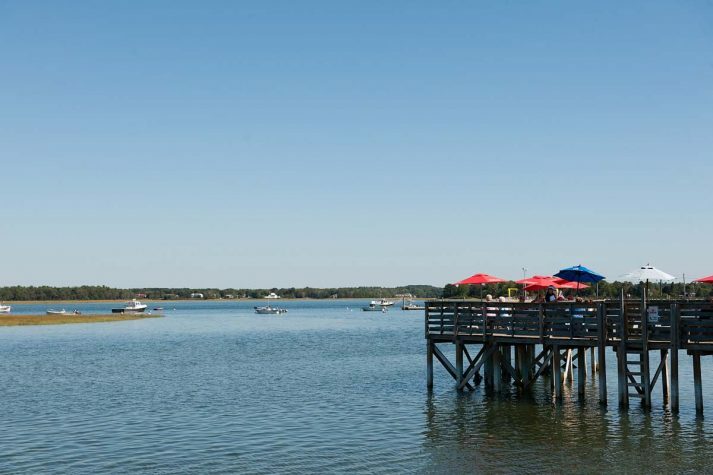 You’ll also find locals bellied up to the bar devouring battered clams (an area specialty) when the season dies down. 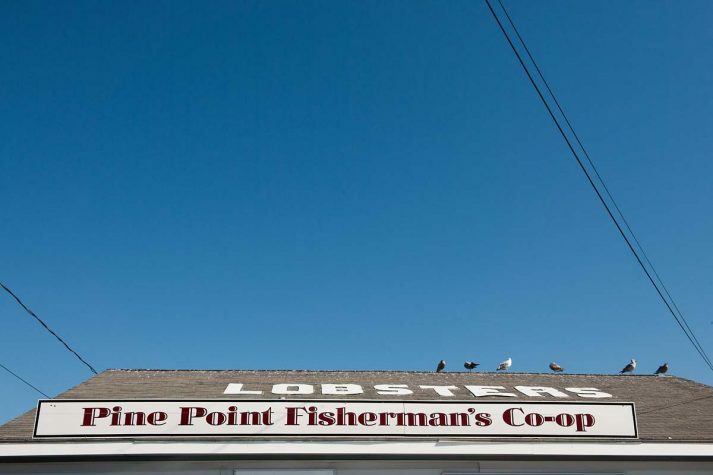 For kids who grow up in Pine Point—and all around Scarborough—a summer job at one of the seafood joints is a rite of passage. 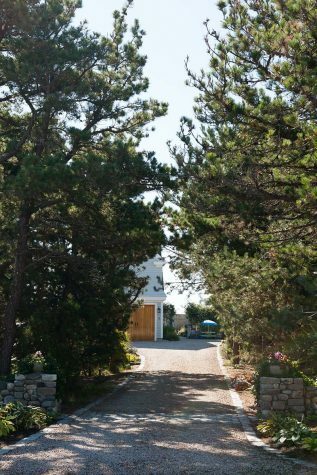 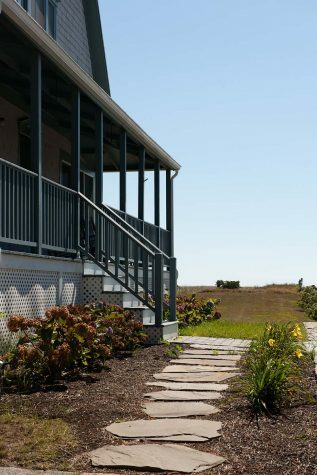 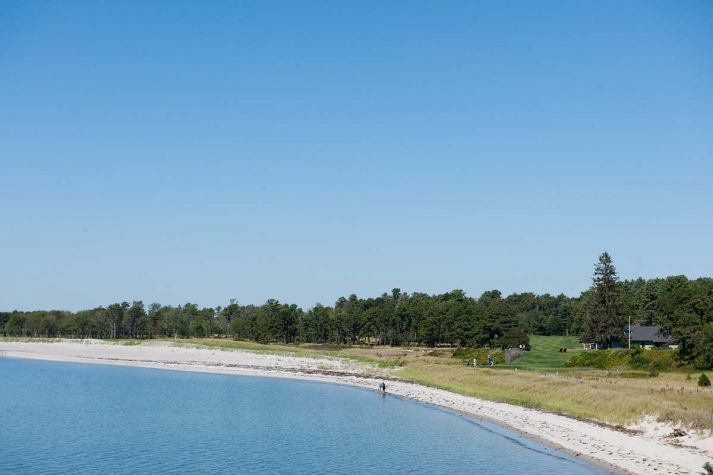 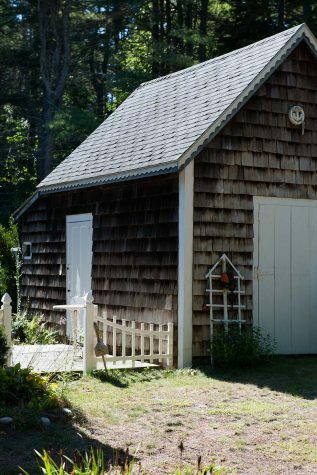 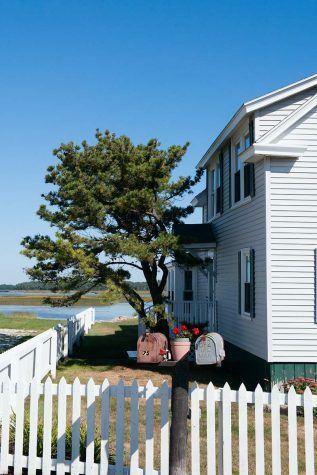 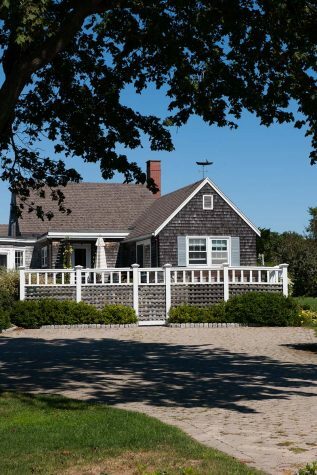 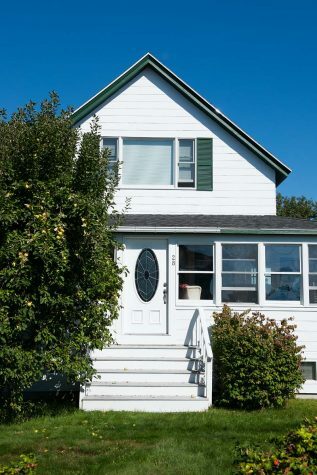 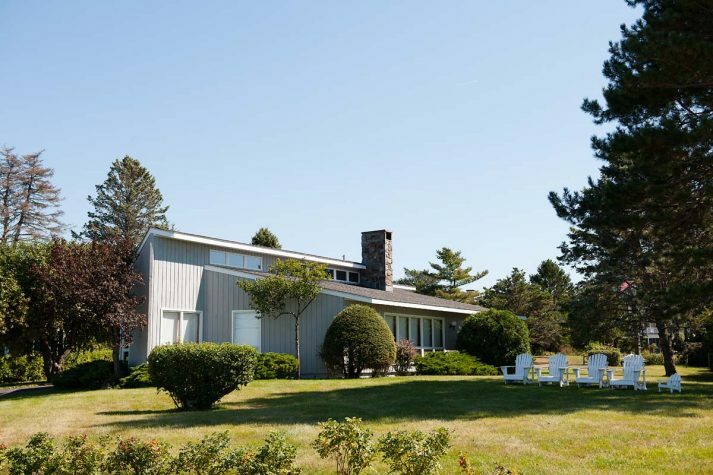 Tourists and second-homeowners have been visiting and summering on Grand Beach for well over a century by now, but in the 1970s Pine Point started making the transition from a year-round fishing village into a largely seasonal community. 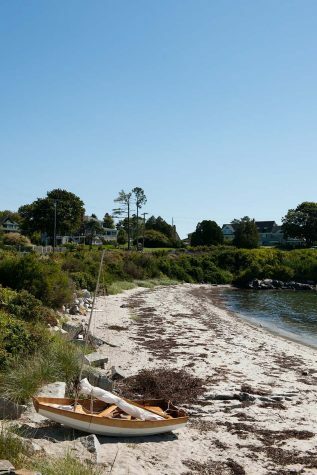 Clough remembers when the neighborhood east of the town landing—now known as Pillsbury Shore—was little more than a frog pond. 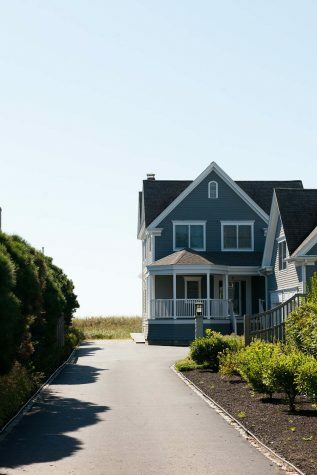 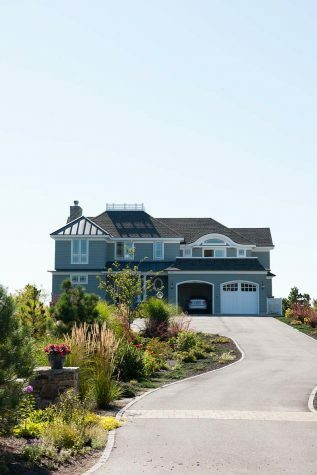 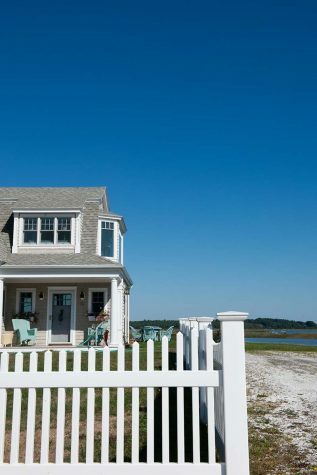 Today, beautiful beach homes rise up along the water’s edge, and Pine Point housing prices have risen significantly, along with the cost of flood insurance. 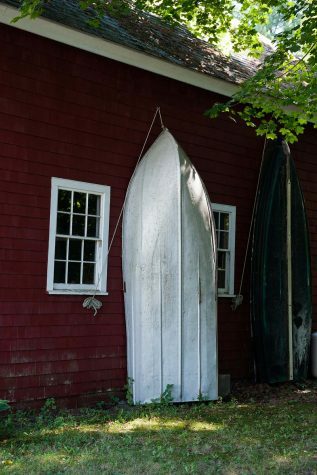 Despite these changes, a strong sense of community perseveres, and Clough sees the same faces year after year. 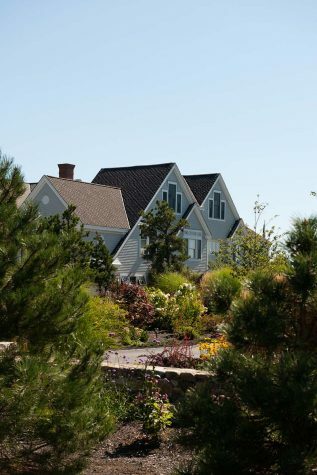 Which is not to say that year-round residents don’t relish that peace and quiet that comes in the fall. 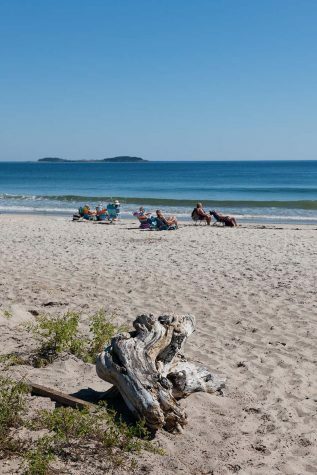 At three o’clock on Labor Day, summer “goes off like a light switch,” says Howell, “and we have this oasis to ourselves.” She and her husband visit the beach throughout the year, and make the most of the area’s proximity to Portland. 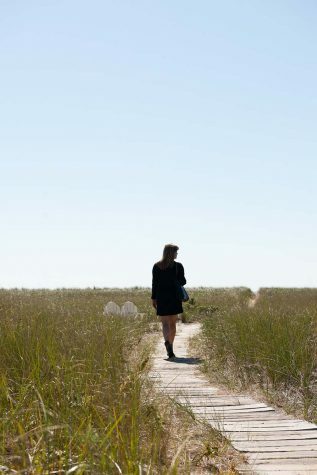 “It’s about quiet enjoyment here,” she says. 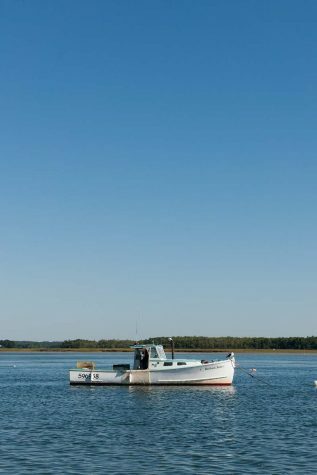 Watching your kids play in the sand, tasting fresh seafood, listening to the putter of lobster boats motoring out to sea at dawn—all of the pleasures of a remote fishing village are available in this beloved community ensconced in a bustling suburb.